The capitol of Shaanxi Province, People’s Republic of China is none other than Xi’an. One of the oldest cities in China, Xi’an has antiquity and culture throughout the city and should not be skipped on a vacation in China. Thanks to Stunning China, the supplier sponsor of this article, you won’t miss anything that Xi’an has to offer. The most populous city in Northwest China, Xi’an also hails as one of the Four Great Ancient Capitals or also known as the Historical Capitals of China. Located in the center of the Guanzhong Plain, Xi’an is one of the most popular destinations in China and it is not hard to see why. With culture, arts, technology, and history there is something for everyone to experience in Xi’an. One of the most notable sights to see while visiting the area is the Terracotta Army. This collection of terracotta figurines depicting the armies of Qin Shi Huang, the first emperor of China, date back to approximately the later period of the 3rd century BCE. It was estimated there were 8,000 soldiers and 130 chariots in the three pits containing the collection, with many of the figures buried at the mausoleum of Qin Shi Huang. To see these incredible pieces of history and art, go to the Terracotta Army Museum. Each of the three pits is different so pay close attention to each room, and do not leave the Terracotta Army Museum without looking at the Exhibition of the Bronze Chariots. While in the area you can also see the Mausoleum of Qin Shi Huang which took over 38 years to construct. Xi’an was once the starting point of the Silk Road and near this point you will find The Fortifications of Xi’an, also known as Xi’an City Wall. One of the oldest and most well-preserved city walls in China, the Fortifications of Xi’an is definitely something to marvel at. 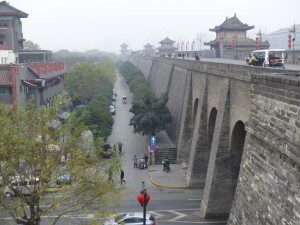 Spanning a total length of 8.7 miles and 39 feet high, and constructed as a defense system with a moat, drawbridge, and watch towers, you could easily spend an afternoon walking along the wall and imagining the city before you as it was centuries ago. The Bell Tower of Xi’an is another centuries-old structure that shows the culture of the city of Xi’an. It is both a symbol of the city, and one of the most exquisite Bell Towers of its kind. Its gold roofing and color painting make the tower a wonderful representation of Ming Architecture, as the structure was built during the Ming Dynasty in 1384. The building reaches upwards 118 feet, and inside on the second floor is a plaque set into the west wall that details the movement of the tower from its original location, with all of its current parts (aside from the base) being original. This feat alone makes the Bell Tower something to see on your Chinese vacation. There are many museums, like the Terracotta Army Museum, found throughout Xi’an that pertain to its lustrous history. Another one of these is The Stele Forest, also known as the Beilin Museum. The museum, which once housed the Confucian Temple, contains 3,000 steles all together, divided into 7 different exhibition halls. It has the largest collection of steles in China, and the collection has been growing since 1087. You can also see painting and calligraphy as well as historical records in the exhibition halls within the museum. Another great museum to browse while visiting Xi’an is the Shaanxi History Museum. Housing over 370,000 items ranging from pottery and paintings to coins and silver objects, the Shaanxi History Museum is one of the first and largest state museums in China with modern facilities. The display of ancient Chinese culture found within the museum in regards to Shaanxi’s rich history is definitely worth the stop. Located not far from the Shaanxi History Museum is the Small Wild Goose Pagoda, another piece of Xi’an’s past. One of two significant pagodas in the city, Small Wild Goose Pagoda is listed as a national AAAA Scenic Spot. Originally having 15 stories (but now only 13 due to an earthquake), the structure was built with blue brick and with true beauty in mind; you can even go inside and climb the stairs to stand on a small open platform. From there you have a spectacular view of Jianfu Temple: the grounds in which the pagoda is located on the central axis of. If it is an exceptionally clear day you might even be able to get a nice panoramic view of the city of Xi’an itself from the top of the pagoda! 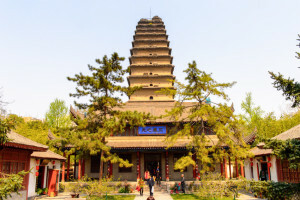 The Giant Wild Goose Pagoda is the other pagoda of notable mention within Xi’an. One of its main functions was to hold sutras and figurines of the Buddha that were brought from India. Although it leans to the west, the structure is still quite a beautiful piece of history to explore on your Xi’an vacation. 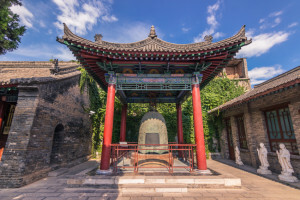 Although Xi’an has so much ancient culture and offers the ability to learn Chinese history at every turn, there are many other ways to spend time in the city. For example, spend an afternoon strolling through the Kaiyuan Shopping mall where you can shop local stores as well as the large name brands. It is one of Xi’an’s largest malls, and offers the comforts of home. For a shopping experience that brings the features Chinese culture and Xi’an, be sure to stop by one of the Antique Markets that take place throughout the city. Wares include paintings and furniture, as well as silk rugs and so much more! Another way to experience the culture of Xi’an without having to hop from museum to museum is through the food. There are an array of local classics, as well as some modern fusion restaurants located throughout the city. Do not miss out on lunch at De Fa Chang, one of the most famous restaurants in Xi’an. 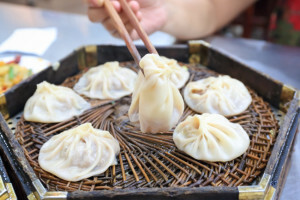 Serving up over 300 varieties of dumplings you will be sure to taste all of China and find one you like! For a delicious dinner, go to Shang Palace Restaurant where they serve up authentic Cantonese, Shaanxi, and Sichuan cuisine; they also serve dishes with a modern, contemporary feel but full of flavor. If you are looking for the ever-popular noodles, look no further than First Noodle Under The Sun, a noodle-based cuisine chain of restaurants. Offering both classic noodle dishes and local specialties, it is popular among locals and tourists alike. Seeing Xi’an in all of its history, culture, and beauty should be on the top of your travel list. Thanks to Stunning China, you’ll have no problem planning your Xi’an getaway.